The gold miners’ good performance in 2014 bodes well for gold not having to worry about a bear market taking place, like in 2013, or about testing again its major $1,178 bottom. We are still witnessing massive accumulation of junior miners’ shares since they touched a major bottom in December of 2013. 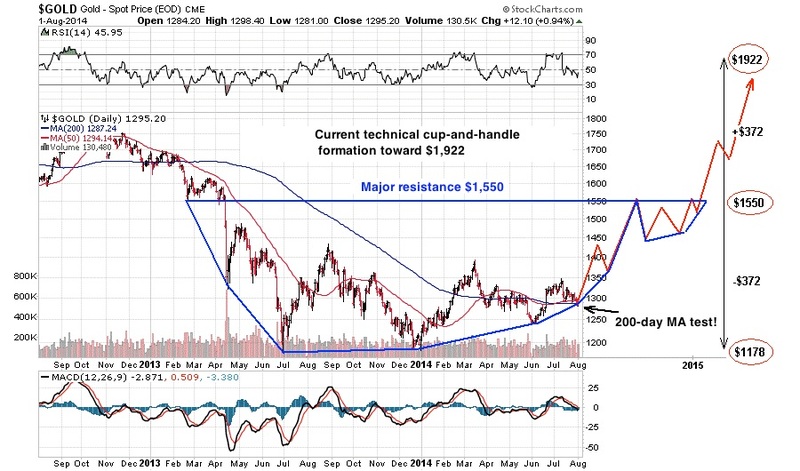 Clearly, the April 2013 breakdown zone for gold, silver and the miners will oppose great resistance to the bull market recovery. This is why I’m anticipating large cup-and-handle formations to cross those crucial zones to the upside. The enormous technical damages done in April, 2013, will necessitate time to be repaired, and I expect a breakout above those resistance zones only by the beginning of 2015. Until then the stock market will have reached a peak and will probably already be in an accelerating phase of its new bear market. 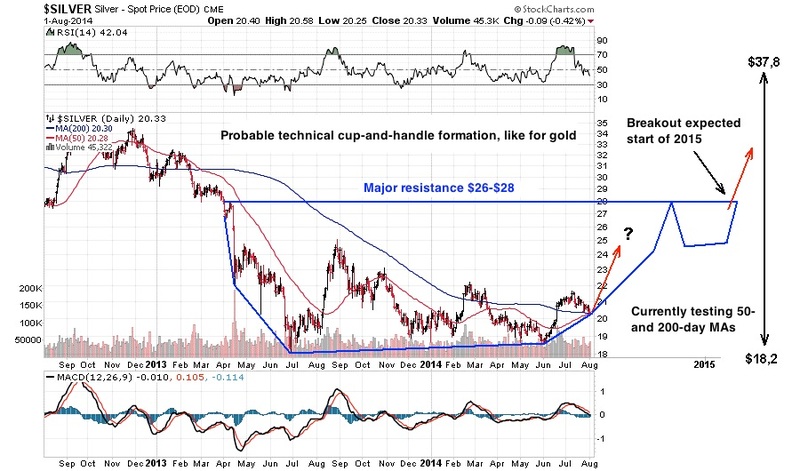 The technical cup-and-handle formation gives, as objective, the equivalent of the cup’s depth, or the former high of around $1,900 for gold. For silver, the theoretical objective is around $38. The current bull market in stocks is exerting a major resistance on the gold market, but nothing can justify such high valuations for stocks and several indicators are in the same territory as when major peaks were forming in 2000-2001 and 2007-2008. 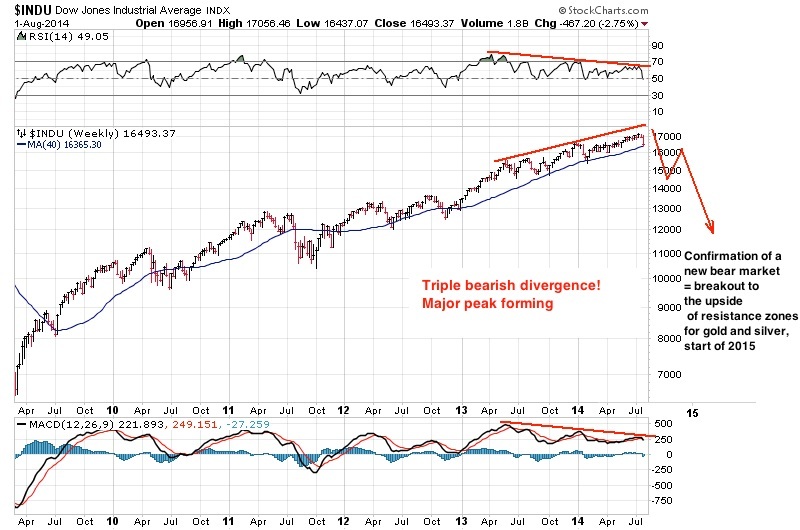 Technically, the triple bearish divergence that has shown up for several months constitutes, I think, a graphic confirmation of the formation of a major peak. Much more than the daily economics news creating short-term volatility, the long-term fundamental trends will sustain the price of gold and keep its secular bull market, far from over, running. Gold’s rise is irresistible in the great correction cycle of Kondratieff’s Winter that started in 2000-2001. No fundamental reason justified the panic selling on the gold market in 2013 and, as a consequence, the gold price is now reflecting out-of-this-world data, such as the end of the debt crisis in the Euro zone, an economic recovery in the United States with a strong dollar, a debt that is easy to sell, a manageable balance sheet for the Fed with a monetary mass that will stop growing to infinity and a world in peace. Financial markets want to believe all of that, and they have forced gold down to reflect it. Whatever may be, we have now reached one of those disrupting periods where the unreal hopes and projections of the financial markets will clash with hard reality, as happened in 2000 and 2007. Periodically, with the help of Fed’s interventions and interest rates set way too low, markets stray totally away from their equilibrium valuation, become a self-fulfilling prophecy to their highs, inflate out of proportion and end up confronting a pin. The nature of the needle doesn’t matter... the bubble always ends up exploding. Despite all the media blitz about gold’s weakness in 2013 and its programmed decline toward $1,000, its price has established a solid base around $1,200 and is recuperating, sustained by gold’s excellent fundamentals. 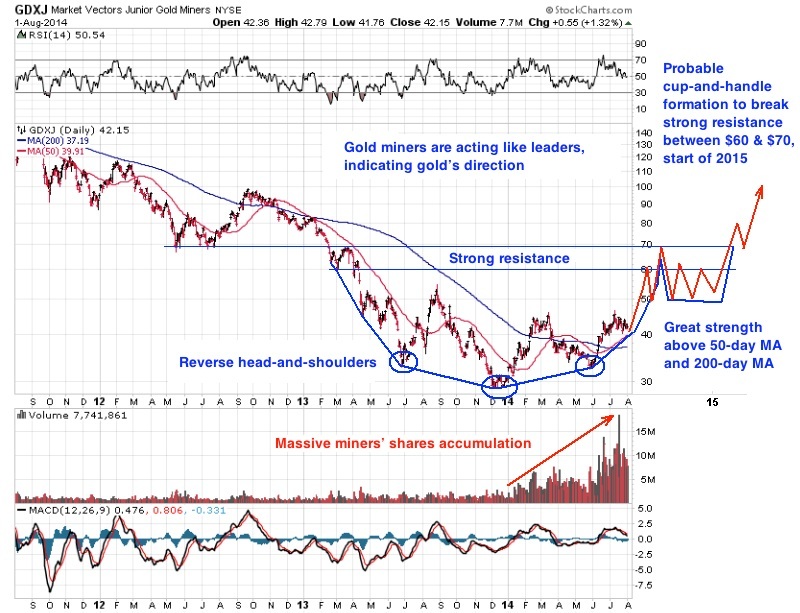 The price of gold is akin to a target-seeking missile head: It can be drawn to a decoy but, sooner or later, it will find its target and hit it. Its targets are called “global debt crisis”, “financial markets crisis” and “global monetary crisis”. Gold’s target-seeking head KNOWS those crises will only grow bigger in time and that a meeting point between gold and the new monetary system is unavoidable, and this is why the gold price has gone up irresistibly since 2001. No matter the evanescent economic recoveries, no matter the coming and going geopolitical events, no matter how much inflation goes up or down, the price of gold is all about the economy’s fundamentals and gold is at the heart of the monetary and financial systems; and its target-seeking head has detected a fatal flaw and it will never let go. No matter the lies and the attacks against it, its price will end up following its initial trajectory. It is detecting a weakening dollar, rejected by more and more countries, tensions in reserves and restricted access to certain commodities, like oil, unmanageable sovereign debts, a corrupted financial system, central banks doing all they can to devaluate their own currencies by inflating the monetary mass to infinity, as well as demographics and social programs compounding all of those problems. In the next crisis cycle of 2015-2021, the bull market in gold will enter its final phase and the gold price will reach heights that are unimaginable today. The mid-cycle correction of 2011-2013 that brought gold back around $1,200 will be seen as a small blip in the longest bull market in gold since it was delinked from the US dollar in 1971. Léonard Santoni has been analysing the gold market since 2003. In 2007, he wrote a book, “2008-2015: Why Gold Will Outperform Stocks And Bonds"